Preparing microscope slides is not overly complicated and can be performed easily with a bit of knowledge. The two types of microscope slide preparation techniques include dry mount slides and wet mount slides. Dry mount slides require a blank glass microscope slide, a glass cover slip, and a non-moisture based specimen. Examples of dry mount slides include insect legs, flower petals, powders or substances such as grains of sand or dry chemicals, dirt samples and even newsprint. When preparing a dry mount slide, place the sample between the glass microscope slide and the cover slip. Press down firmly on the cover slip in order to flatten the sample. When using a high power microscope, if the sample is not flat, it will not be fully in focus, especially at higher magnifications. 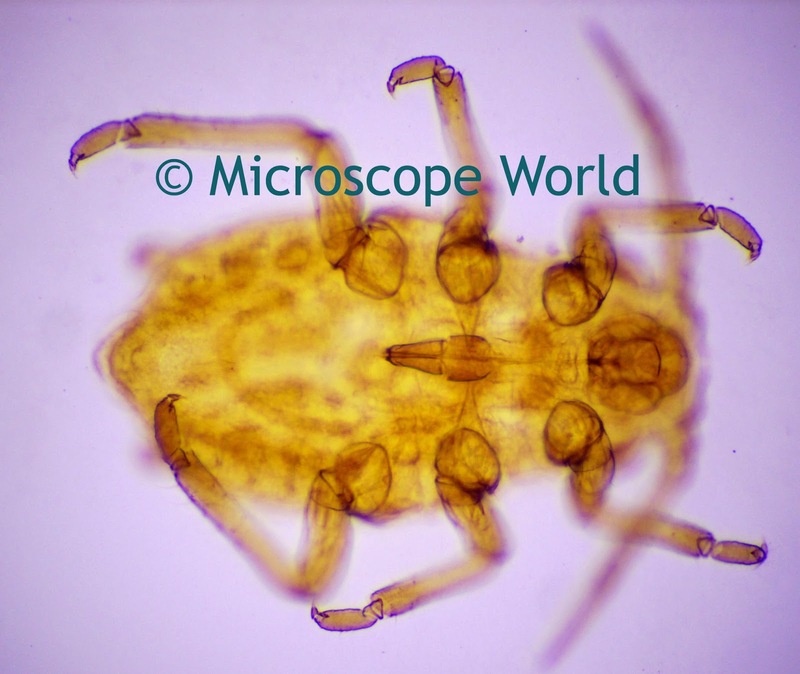 Aphid captured at 100x magnification. (Example of a dry mount slide). Wet mount slides are used to view liquids under the microscope. Preparation of a wet mount slide includes a depression slide, a cover slip, and an eye dropper can be useful, but is not required. Wet mount slide samples might include pond water, cheek cells, blood or sperm samples. When preparing the wet mount slide, place a small drop of the sample between the depression slide and the cover slip. Use a paper towel when pressing the cover slip onto the slide, as some of your sample might run out over the edges. If you want to create a permanent slide, you can line the edges of your cover slip with clear nail polish. This will allow you to permanently affix it to the slide, locking the moisture into the chamber you create between the depression slide and the cover slip. If you make your slide permanent be sure to seal the entire edge of your cover slip so the sample does not evaporate over time. 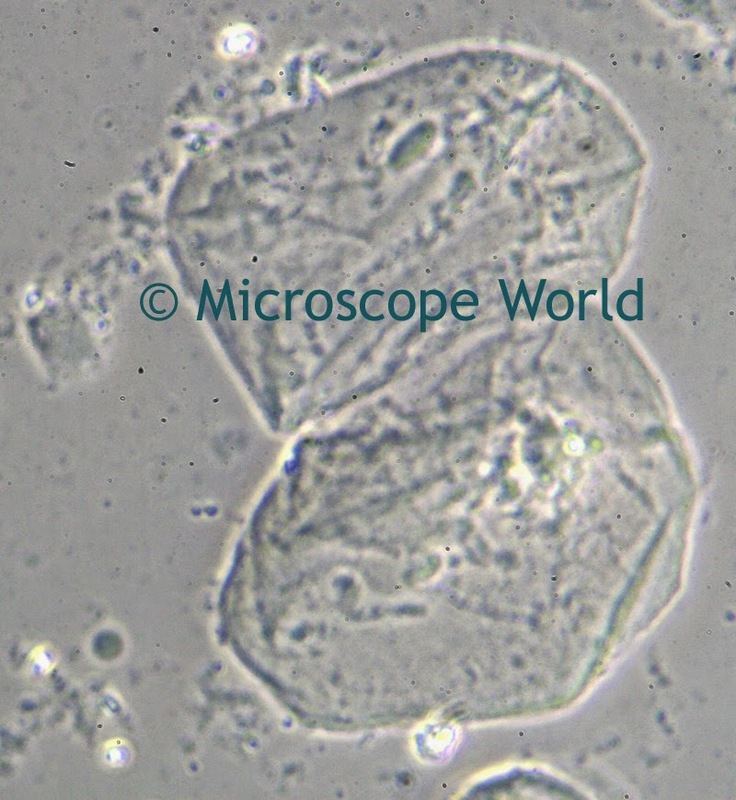 Cheek cells captured under a phase contrast microscope at 400x. (Example of a wet mount slide). If your sample requires staining you can learn about the different types of staining and how to stain your microscopy specimens here.